In PTC Windchill 10.2 M010, you can customize an action associated with a business object so that the action immediately executes a set of business rules and provides feedback on the outcome. Business rules can be executed using the workflow. The results display on a workflow task. With the PTC Windchill 10.2 M010 release, you can customize an action associated with a business object so that the action immediately executes a set of business rules and provides feedback on the outcome. 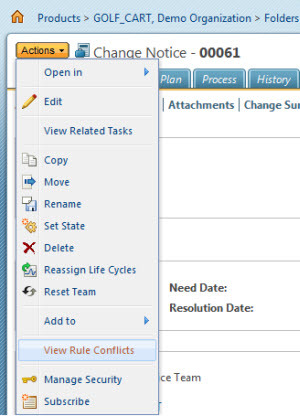 Users working on or reviewing change tasks may want verify no conflicts exist before the Audit Change Notice task runs. The user can select an action at any time to run the business rule sets that have been associated to the action. This is a customization that required extending business rules. See the “Evaluating Business Rules On Demand” section of the PTC Windchill Customization Guide or the online help topic in the PTC Windchill Help Center for instructions. The new support allows administrators to more easily customize the launch of business rule sets from the Actions list.